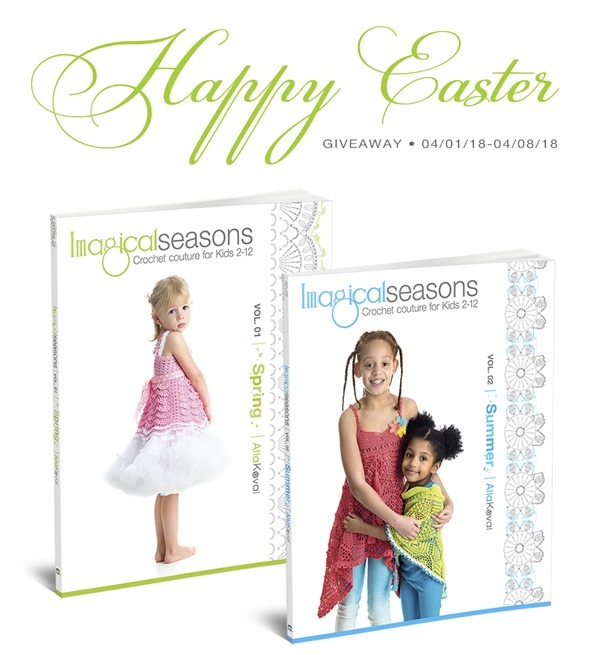 Home » Giveaway, Holidays	» Happy Easter | Giveaway Time! Happy Easter | Giveaway Time! I hope you all have a safe and peaceful Easter! A book always makes a fantastic gift, and crochet pattern books for crafters are not exclusion! 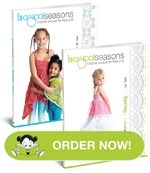 Win two my Crochet pattern books Imagical Seasons: Crochet Couture for Kids 2-12: Spring, volume 01 & Summer, volume 02. A Winner will receive the books in both, – paperback and PDF format! PLEASE NOTE: This is first time I decided to host 3 same giveaways: here on my blog, on Facebook and Instagram! Make sure to enter on all three platforms to triple your chance to win! Optional Entry # 2: Blog about this giveaway, linking to this post, and leave another comment to this post with a link to your blog post. Optional Entry # 3: Share this post on your accounts: at Google+, Facebook, Ravelry, Twitter, Yahoo, etc., leave one more comment on this post (if possible, with your link, but here is no any obligations). You also can just share my original Google+ and Facebok posts. Share on more networks for more entries! (one additional entry per one network). This contest starts today, April 1st, 2018 and will end on April 8th, 2018 at 11:59pm PST. I’ll select the winner with random.org’s random number generator. The Winners will be notified by email on April 9th, 2018. Good luck everyone and lets fun begin! Have a fabulous day with your family and friends! To enjoy more spring deals, please visit my Etsy, Ravelry, Amazon and ImagicalSeasons.com stores! 23 Responses to Happy Easter | Giveaway Time! My favorite colors for spring are lavender and white. Love your patterns. I can see my granddaughters dressed in them now. Thanks for the chance to win your books. My three favorite colors ANY TIME OF THE YEAR are lime green,orange, and turquoise. Those colors are excellent for spring designs in my opinion. For spring I love yellows, pinks, greens and blues in soft bright shades. Those colors remind me of Easter and blooming flowers. My favorites are,purple,white and yellow. My favorite colors for Spring are pink, blue and bright white. I love pastel pinks, lavendar and mint green! For spring, I love a combination of light greens in different shades, yellow, and white. I love yellow, creams and greens for spring. Love your patterns and a chance to win is so exciting. So very excited with the chance to win this amazing giveaway! Thank you so much!!! My favorite colors for spring are white, mint and lavender. Thank you for the opportunity to win your books. My favourite colours for spring are yellow and pink! My daughter looks absolutely adorable in yellow -land pink! Ooo I love white with any of the blues and teal. I love green and yellow also rust orange. I crochet for my great-grandchildren mostly. “Randomly”, it would be nice to come out a winner! And, I’m into all colours. My favorite colors are lime, aqua, blue, pink and red. I love warm shades and jewel tones. My granddaughter loves pinks and greens.